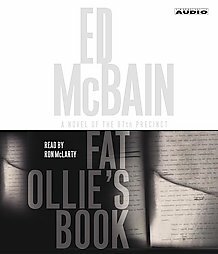 I love Ed McBains book and Fat Ollie's Book was just as good as all the rest. I love how Ollie is always convinced that he is right and the best at everything he does, even when those around him know that he just another arrogant bigot. Of you told Ollie the truth about himself, he would never believe you, not for a second. As crime novels go, this one is not particularly good. Maybe fun to listen to once, but I won't be renting it again.